Freezing temperatures, dry air, wet soil or drought can cause rosemary plants (Rosmarinus officinalis) to turn brown. Rosemary is hardy in U.S. Department of Agriculture plant hardiness zones 8 through 10. In USDA zones 7 and lower, overwintering rosemary plants indoors avoids browning from frosts, but can cause other problems. These aromatic shrubs grow 2 to 6 feet tall and 2 to 4 feet wide, and feature needlelike, gray-green leaves on upright stems. 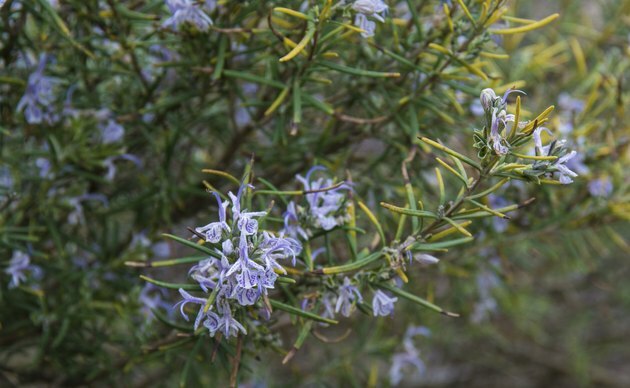 Two-lipped, pale blue or white flowers appear on rosemary plants in summer. Snap frosts turn rosemary plants brown, and they can't survive freezes. Freezing winds can damage one side of plants, or whole plants can turn brown. Frost damage can make rosemary plants appear dead, but often there's some living wood remaining. Scrape back the bark on several stems with a thumbnail to check the amount of damage. Living wood is green under the bark, and dead wood is brown. When new growth appears in spring, sterilize pruning shear blades by wiping them with a cloth that was dipped in rubbing alcohol, and prune the brown, dead stems. Prune just above the new growth. Sterilize the pruning shears again when you've finished. Dry air indoors causes brown leaf tips and die back on rosemary plants. Overwintering rosemary indoors provides protection from frosts, but the air in many homes is too dry for the plants, which grow best in humid environments. Stand rosemary plants in their containers on trays filled with pebbles and water. Mist the plants with a hand mister filled with clean, cool water every day. Spray the leaves until the water is about to drip. Wet, poorly drained soil drowns rosemary roots, and the plants turn brown and die. Rosemary grows best in freely draining soil or potting soil. Heavy clay soil and other poorly draining soil cause brown foliage when rosemary roots die. The worst effects occur in winter, when rosemary plants stop growing. Overwatering is a common cause of brown leaves and leaf drop in rosemary plants overwintering indoors. Water rosemary plants in containers when the soil is dry to a depth of 1 inch. Ensure containers have drainage holes. Pour water over the potting soil surface until it flows through the bottom. Don't leave rosemary plants in containers standing in water. Rosemary plants tolerate drought, but their leaves turn brown when the plants receive too little water. Sunny spots and dry to medium moisture, sandy or slightly rocky soil provide the best growing conditions for rosemary. Mixing a 2-inch layer of compost into the soil when planting improves drainage and moisture retention. Water in-ground rosemary plants when the soil is dry to a depth of 2 inches. Spray water from a garden hose over the root area of the plants until the water begins to puddle, then stop. How Can I Revive My Boston Fern?